March 10, 2013: It's Saturday at the Movies! I added 23 more ads today, all fr om March 1982, plus three more Random Pages gallery additions from Peach Sections of The Blade, including a Tuesday, 3/2/82 story, “Mengel Leaves Ch. 13 For Post In Columbus.” Next is a Tuesday, 3/9/82 story by To m Gearhart, “CableSystem to Telecast Free Movies And Specials” and also includes items about WSPD-AM, the Easter Seal Telethon on Channel 24, Toledoan Jim Kelly on CBS, and Phil Donahue in Detroit. There's also a Thursday, 3/1 1/82 story, “Lamont McLoughlin Accepts Post In South.” There's one addition to the Channel 11 gallery, a Monday, 3/22/82 ad for In Good Health with Bob Lawrence hosting a program about cancer. 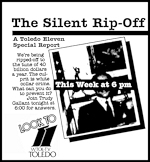 There's also one addition to the News/Special Reports Ads gallery, a Monday, 3/1/82 ad for “The Silent Rip-Off,” a Trudy Gallant Toledo Eleven News report. There's also one addition to the Channel 24 gallery, a Friday, 3/5/82 full-page ad for Little House on the Prairie, which would begin airing at 5:00 on Monday, the 8th. 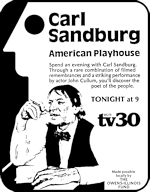 There are thirteen additions to the the PBS gallery, twelve of them for channel 30, including a Tuesday, 3/2/82 ad for American Playhouse, “Sandburg—Echoes a nd Silences” (John Cullum). Next is a Wednesday, 3/3/82 ad for Live From the Met and the movie, “Invitation to the Dance” (Gene Kelly), followed by a Friday, 3/5/82 ad for the movie, “The Americanization of Emily” (James Garner, Julie Andrews). There's also a Saturday, 3/6/82 ad for five movies, “Hold Back the Dawn,” “Algiers,” “Welcome Stranger,” “Rose of Washington Square” and “Auntie Mame” (Rosalind Russell). There's a Tuesday, 3/9/82 ad for Life on Earth, “The Rise of the Mammals,” River of Sand and the movie, “Blue Skies” and a Thursday, 3/11/82 ad for the movie, “Becket” (Richard Burton, Peter O'Toole). Next is a Friday, 3/12/82 ad for The Kingston Trio and Friends and the movie, “My Gal Sal” and a Monday, 3/15/82 ad for Brideshead Revisited, “Orphans of the S torm,” Bernstein—Beethoven, and A Portrait of Grandpa Doc. There's also a Wednesday, 3/17/82 ad for two St. Patrick's Day movies, “Irish Eyes are Smil ing” and “Sweet Rosie O'Grady” and a Thursday, 3/18/82 ad for Down Home Country Music and Austin City Limits with Kris Kristofferson. And there are two F riday, 3/19/82 ads, the first ad for Big Bird's 10th birthday on Sesame Street, and the second ad for two mo re movies, “A Guy Named Joe” and “Waterloo Bridge” (Vivian Leigh, Robert Taylor). 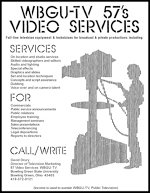 There's also a Monday, 3/22/82 ad for WBGU-TV 57's Video Services. There are three additions to the Buckeye CableSystem gallery, all for a free preview of Showtime and The Movie Channel, a Wednesday, 3/10/82 ad, a Saturday, 3/13/82 ad, and a Wednesday, 3/17/82 ad. Only the last ad is on the front page. There are two additions to the Vintage Cable Ads gallery, both for college basketball on ESPN, a Friday, 3/5/82 ad for the PCAA Tournament Final and a Thursday, 3/18/82 ad for the NCAA Tourna ment regional semifinal games. 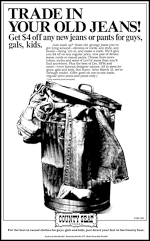 The last two additions today are in the Other Vintage ads gallery, a Wednesday, 5/3/82 ad f or the County Seat stores at Southwyck and Woodville Mall (Trade in your old jeans!) and a Friday, 3/19/82 ad for the Pepsi Challenge TV Cash Game, seen on PM Magazine. Newer PostMarch 12, 2013: Very Soon!